We demonstrate for the first time that an ultra-broadband 7 femtosecond (fs) few-cycle laser can be used for multicolor nonlinear imaging in a single channel detection geometry, when employing a time-resolved fluorescence detection scheme. On a multi-chromophore-labelled cell sample we show that the few-cycle laser can efficiently excite the multiple chromophores over a >400 nm two-photon absorption range. By combining the few-cycle laser excitation with time-correlated single-photon counting (TCSPC) detection to record two-photon fluorescence lifetime imaging microscopy (FLIM) images, the localization of different chromophores in the cell can be identified based on their fluorescence decay properties. The novel SyncRGB-FLIM multi-color bioimaging technique opens the possibility of real-time protein-protein interaction studies, where its single-scan operation translates into reduced laser exposure of the sample, resulting in more photoprotective conditions for biological specimens. E. M. Phizicky and S. Fields, “Protein-Protein Interactions: Methods for Detection and Analysis,” Microbiol. Rev. 59(1), 94–123 (1995). S. W. Hell, “Far-field optical nanoscopy,” Science 316(5828), 1153–1158 (2007). M. Orrit, “Nobel Prize in Chemistry: Celebrating optical nanoscopy,” Nat. Photonics 8(12), 887–888 (2014). K. König, “Clinical multiphoton tomography,” J. Biophotonics 1(1), 13–23 (2008). X. Yang, H. Xie, E. Alonas, Y. Liu, X. Chen, P. J. Santangelo, Q. Ren, P. Xi, and D. Jin, “Mirror-enhanced super-resolution microscopy,” Light Sci. Appl. 5(6), e16134 (2016). U. Fuchs, U. Zeitner, and A. Tünnermann, “Ultra-short pulse propagation in complex optical systems,” Opt. Express 13(10), 3852–3861 (2005). N. Accanto, J. B. Nieder, L. Piatkowski, M. Castro-Lopez, F. Pastorelli, D. Brinks, and N. F. van Hulst, “Phase control of femtosecond pulses on the nanoscale using second harmonic nanoparticles,” Light Sci. Appl. 3(1), e143 (2014). J. H. Chung and A. M. Weiner, “Ambiguity of ultrashort pulse shapes retrieved from the intensity autocorrelation and the power spectrum,” IEEE J. Sel. Top. Quantum Electron. 7(4), 656–666 (2001). R. Trebino, Frequency-Resolved Optical Gating: The Measurement of Ultrashort Laser Pulses (Springer US, 2000). J. Squier and M. Müller, “High resolution nonlinear microscopy: A review of sources and methods for achieving optimal imaging,” Rev. Sci. Instrum. 72(7), 2855–2867 (2001). D. Entenberg, J. Wyckoff, B. Gligorijevic, E. T. Roussos, V. V. Verkhusha, J. W. Pollard, and J. Condeelis, “Setup and use of a two-laser multiphoton microscope for multichannel intravital fluorescence imaging,” Nat. Protoc. 6(10), 1500–1520 (2011). P. Mahou, M. Zimmerley, K. Loulier, K. S. Matho, G. Labroille, X. Morin, W. Supatto, J. Livet, D. Débarre, and E. Beaurepaire, “Multicolor two-photon tissue imaging by wavelength mixing,” Nat. Methods 9(8), 815–818 (2012). K. Wang, T.-M. Liu, J. Wu, N. G. Horton, C. P. Lin, and C. Xu, “Three-color femtosecond source for simultaneous excitation of three fluorescent proteins in two-photon fluorescence microscopy,” Biomed. Opt. Express 3(9), 1972–1977 (2012). K.-C. Li, L. L. H. Huang, J.-H. Liang, and M.-C. Chan, “Simple approach to three-color two-photon microscopy by a fiber-optic wavelength convertor,” Biomed. Opt. Express 7(11), 4803–4815 (2016). H. Studier, H. G. Breunig, and K. König, “Comparison of broadband and ultrabroadband pulses at MHz and GHz pulse-repetition rates for nonlinear femtosecond-laser scanning microscopy,” J. Biophotonics 4(1-2), 84–91 (2011). C. Wang and A. T. Yeh, “Two-photon excited fluorescence enhancement with broadband versus tunable femtosecond laser pulse excitation,” J. Biomed. Opt. 17(2), 025003 (2012). A. Klinger, L. Krapf, R. Orzekowsky-Schroeder, N. Koop, A. Vogel, and G. Hüttmann, “Intravital autofluorescence 2-photon microscopy of murine intestinal mucosa with ultra-broadband femtosecond laser pulse excitation: image quality, photodamage, and inflammation,” J. Biomed. Opt. 20(11), 116001 (2015). I. Pope, W. Langbein, P. Watson, and P. Borri, “Simultaneous hyperspectral differential-CARS, TPF and SHG microscopy with a single 5 fs Ti:Sa laser,” Opt. Express 21(6), 7096–7106 (2013). C. W. Chang, D. Sud, M. A. Mycek, and C. B. Mycek, “Fluorescence Lifetime Imaging Microscopy,” Methods Cell Biol. 81, 495–524 (2007). T. Niehörster, A. Löschberger, I. Gregor, B. Krämer, H.-J. Rahn, M. Patting, F. Koberling, J. Enderlein, and M. Sauer, “Multi-target spectrally resolved fluorescence lifetime imaging microscopy,” Nat. Methods 13(3), 257–262 (2016). W. Becker, A. Bergmann, E. Haustein, Z. Petrasek, P. Schwille, C. Biskup, L. Kelbauskas, K. Benndorf, N. Klöcker, T. Anhut, I. Riemann, and K. König, “Fluorescence lifetime images and correlation spectra obtained by multidimensional time-correlated single photon counting,” Microsc. Res. Tech. 69(3), 186–195 (2006). F. Bestvater, E. Spiess, G. Stobrawa, M. Hacker, T. Feurer, T. Porwol, U. Berchner-Pfannschmidt, C. Wotzlaw, and H. Acker, “Two-photon fluorescence absorption and emission spectra of dyes relevant for cell imaging,” J. Microsc. 208(Pt 2), 108–115 (2002). T. S. Viewer, “SpectraViewer,” . S. Akturk, X. Gu, M. Kimmel, and R. Trebino, “Extremely simple single-prism ultrashort- pulse compressor,” Opt. Express 14(21), 10101–10108 (2006). M. Miranda, C. L. Arnold, T. Fordell, F. Silva, B. Alonso, R. Weigand, A. L’Huillier, and H. Crespo, “Characterization of broadband few-cycle laser pulses with the d-scan technique,” Opt. Express 20(17), 18732–18743 (2012). R. Weigand, M. Miranda, and H. Crespo, “Oscilador láser de Titanio:zafiro de 2 ciclos ópticos Titanium:sapphire laser oscillator delivering two-optical-cycle pulses,” in Opt. Pura Apl. (2013), p. 46(2), 105–110. M. Miranda, T. Fordell, C. Arnold, A. L’Huillier, and H. Crespo, “Simultaneous compression and characterization of ultrashort laser pulses using chirped mirrors and glass wedges,” Opt. Express 20(1), 688–697 (2012). 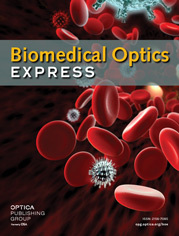 G. McConnell and E. Riis, “Two-photon laser scanning fluorescence microscopy using photonic crystal fiber,” J. Biomed. Opt. 9(5), 922–927 (2004). C. Xu and W. W. Webb, “Measurement of two-photon excitation cross sections of molecular fluorophores with data from 690 to 1050 nm,” J. Opt. Soc. Am. B 13(3), 481 (1996). S. Tang, T. B. Krasieva, Z. Chen, G. Tempea, and B. J. Tromberg, “Effect of pulse duration on two-photon excited fluorescence and second harmonic generation in nonlinear optical microscopy,” J. Biomed. Opt. 11(2), 020501 (2006). S. N. Arkhipov, I. Saytashev, and M. Dantus, “Intravital Imaging Study on Photodamage Produced by Femtosecond Near-infrared Laser Pulses In Vivo,” Photochem. Photobiol. 92(2), 308–313 (2016). K. König, T. W. Becker, P. Fischer, I. Riemann, and K.-J. Halbhuber, “Pulse-length dependence of cellular response to intense near-infrared laser pulses in multiphoton microscopes,” Opt. Lett. 24(2), 113–115 (1999). W. Be, “The bh TCSPC Handbook 5th edition,” 891 (Springer, 2017). J. Enderlein and R. Erdmann, “Fast fitting of multi-exponential decay curves,” Opt. Commun. 134(1–6), 371–378 (1997). J. M. Dela Cruz, I. Pastirk, M. Comstock, V. V Lozovoy, and M. Dantus, “Use of coherent control methods through scattering biological tissue to achieve functional imaging,” Proc. Natl. Acad. Sci. USA. 101(49), 16996 (2004). Fig. 1 SyncRGB conditions and setup. a) Laser sources and chromophores: a) Normalized spectra of the 70 fs and 7 fs laser systems and adapted single photon absorption spectra of dyes on the FluoCells #1 sample. b) Multi-photon fluorescence lifetime imaging microscopy (MP-FLIM) setup based on a femtosecond laser source, temporal compressor and a sample scanning inverted microscope setup equipped with a single PMT detector synchronized with the pulsed laser Sync signal via fast single-photon counting electronics. The measuring head of the d-scan pulse characterization and compression system is mounted at the sample position in the focus of the objective to determine and compensate the dispersion due to the used high-NA microscope objectives before performing MP-FLIM imaging experiments. c) Autocorrelation measurements of the narrow band fs laser in the uncompressed (blue, 200 fs) and compressed pulse configurations (red, 70 fs), measured on target. The Fourier-limited duration of the narrowband laser is 70 fs, hence the autocorrelation measurements indicated that the laser was close to optimum compression. d) d-scan measurements of the pulse on target. Top: measured d-scan trace. Bottom: retrieved d-scan trace, corresponding to a 7 fs pulse at optimum compression. e) Comparison of measured pulse shapes: Blue - 7 fs pulse measured on-target with d-scan, having almost 80% of the transform limited peak power. Red - Gaussian pulse with 70 fs intensity FWHM and the same energy as the blue curve. f) Pulse-length-dependent intensity signal strength of DAPI. Intensities are compared with spectral power density and overlap where two photon absorption of DAPI has been considered. Size of data points represents the uncertainty. Fig. 2 Comparison of S/N in multi-photon images taken with different laser sources. Top row and bottom row show identical data using different color maps. (a1, a2) Uncompressed (200 fs) and (b1, b2) compressed (70 fs) pulses from the standard laser oscillator. (c1, c2) Compressed few-cycle 7 fs laser. Scale bar in a1 is 10 µm and is used for all images; all images are 110 × 110 pixels with a pixel dwell time of 30 ms = 363 s/scan. Fig. 3 SyncRGB imaging using a 7 fs source. Multi-photon intensity images of the same sample areas taken with the compressed 70 fs Ti:Sapphire laser (a, c) and with the broadband 7 fs laser source (b, d). For both lasers, two filter configurations were chosen, either a 685 nm short pass filter that transmits the emission wavelength ranges of all three chromophores (top), or in addition a RG630 filter was placed in front of the detector – selective for the Mitochondria label: MitoTracker Red (bottom). For the 70 fs laser no MitoTracker Red fluorescence is detected (c), whereas the 7 fs excitation pulses enable detecting intensity contributions inside the cell cytoplasm (d). Scale bar in (a) is 5 µm and is used for all images and a pixel dwell time of 20 ms for all images. (a-b) are 100 × 100 pixels = 200 s/scan while (c-d) are 32 × 32 pixels = 20.5 s/scan. Fig. 4 SyncRGB FLIM using ultra-broadband laser excitation for MP-FLIM. MP FLIM images of 2D FluoCells #1 sample. Average fluorescence lifetime histogram for the a) 70 fs and b) 7 fs laser systems. c) 70 fs system at 730 nm, showing only resonant absorption with DAPI in the cell nuclei and Alexa Fluor 488 in the cytoplasm giving rise to one lifetime throughout the cell. White arrows indicating areas without fluorescence intensity in the case of the 70 fs laser system. d) 7 fs few-cycle laser system resonant with all three chromophores on the sample, giving rise to three distinct lifetimes throughout the cell and enabling identification of distinctive cell constituents. Especially the areas indicated by the white arrows for the 70 fs system are actively fluorescing for the 7 fs. All images are 110 × 110 pixels with a pixel dwell time of 30 ms = 363 s/scan. Fig. 5 Large area SyncRGB intensity and lifetime imaging on a pig artery sample with Hoechst 33342 stained cell nuclei. a) Large area fluorescence intensity image of a pig artery. The image is stitched together from 11 individual 200 × 200 µm (50x50 pixels) scans with 50 µm overlap and a pixel dwell time of 20 ms = 50 s/scan. Major elements of the artery are indicated and can be distinguished by their fluorescence signal contribution. b) SyncRGB image of the large scan area using MP-FLIM. c) Close up intensity image of the endothelium part where the weak fluorescence and concentration of the Hoechst 33342 stained cell nuclei make them not clearly identifiable against the autofluorescent background. d) Close up image of the endothelium part clearly showing the position of Hoechst 33342 stained cell nuclei. The positions of Hoechst 33342 stained cell nuclei are indicated by arrows. Fig. 6 Pulse-regime-dependent deep tissue scanning on a pig artery stained with Hoechst 33342. a) 70 fs laser based deep tissue multi-photon image stack. b) 7 fs laser based multi-photon image stack. c) SyncRGB MP-FLIM deep tissue stack using the 7 fs laser. Individual scans are 200 × 200 µm with 40 × 40 pixels and pixel dwell time of 10 ms = 16 s/scan. Besides increased depth sensitivity observed for the ultra-short laser, the FLIM detection enables identifying similar composition tissue areas.